With the coming of fall, I find myself thinking of apples, and fires in fireplaces, and the classic white farmhouse. Does it get any more Americana-traditional than that? This white clapboard farmhouse on Long Island celebrates the area's historical farming past, while updating the decor for a young family with contemporary tastes. This spirited home by David Netto (you know him from the uber famous Boxwood project with architect Gil Schafer delivers an historic home with an eclectic spirit. The white clapboard exterior complete with black shutters is understated and elegant. 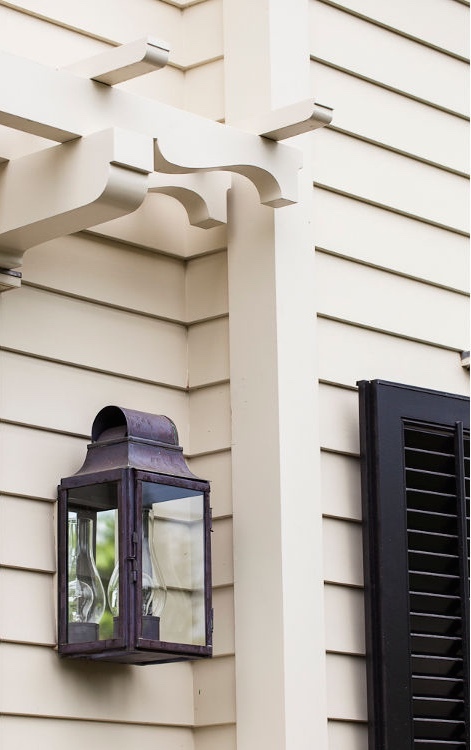 The spare exterior is the perfect backdrop for beautiful woodworking and lanterns. Beadboarding and wainscoting reign supreme throughout a lot of the first floor. All painted white, the geometric lines of the woodwork give an open airy feeling to a home with lower ceilings - appropriate to the historic feeling of the home. In the living room a marigold sofa adds a warm focal point to the mostly neutral space, continuing the palette of the flyer. The layering of natural textures in beiges, browns, and tans add a lot of organic appeal. The soft window treatments provide a curvy balance against the straight lines of the beadboarding as well. The gorgeous green and gold federal style mirror introduces one of the home's major accent colors, a deep emerald. The library is a stunning emerald jewel box in the mostly neutral first floor. An antique day bed functions as a deep and cozy sofa, nestled between built-in bookshelves. This half of the library, with its chintz covered chairs, brass fixtures and standing lamps, tailored window treatments, and deep windows with entresols, nicely nods to the grand libraries in the estates that dot the landscape of the north shore of Long Island. The juxtaposition of this very traditional part of the library with crisp white boarding, and light-hearted contemporary sconces gives such a youthful and playful energy to the home. The master bedroom is a rich yet pastoral hideaway. I love the contrast of the gingham wallpaper, the floral drapes, and the kilim rug. The mix of pieces in the master bedroom continues the eclectic, collected feel of the home. And, man, is that gingham wallpaper calling my name. The daughter's bedroom is cozy, sophisticated, and beautiful. Props to David Netto and his teams, because the mixing of floral wallpaper and floral draperies in this room is really masterful. The parsons style nightstand, sleek ceramic lamp, vintage daisy mirror, and rattan beds add a contemporary lightness to the room. And how sweet is the little "Beatrice" pillow? A son's bedroom is another really masterful mix of styles. Although the walls and draperies are covered in an old school floral, the orange bunk beds, crisp bedding, vintage lamps, Saarinen style nightstand, and curvy rattan chair contrast so strikingly with those walls, that it gives the room some serious swagger. This round pool with its bombastically striped and scalloped pool pavilion is yet another contemporary riff on what would be a traditional element of a classic home on the north shore of Long Island. The dramatic allee of trees of small but impactful. This farmhouse is really filling my need for all things traditional and autumnal right now. What a great place to light a fire on a chilly, clear evening, and enjoy some cider and the changing of the seasons! The contrast of traditional themes and shapes with contemporary elements and finishes gives this historic feeling home an energetic, youthful edge.